Rock out with the Sony ZS-BTG900 Bluetooth Wireless Boombox. Pair the speaker with any Bluetooth capable device for wireless operation, or connect it to any device with a standard 3.5mm audio output (cable sold separately). The speaker is also compatible with Near Field Communications technology (NFC). This allows you to align the NFC logo with the logo on another NFC compatible device in order to turn the speaker on, activate Bluetooth, pair the devices and start streaming your music. The speaker has a built-in AM/FM tuner with 30 presets so you can also listen to local radio, talk and music programs. For added visual appeal, the Sony Bluetooth Wireless Boombox features lighting effects that synchronize with whatever audio source you're listening to. The boombox includes a remote control, which offers full functionality from anywhere in the room. Additionally, you can feel free to roam with the speaker at your side since it runs on AC or batteries. Load it with eight D batteries and you can enjoy up to 20 hours of playback. Box Dimensions (LxWxH) 25.5 x 16.0 x 10.0"
ZS-BTG900 Bluetooth Wireless Boombox is rated 4.8 out of 5 by 9. 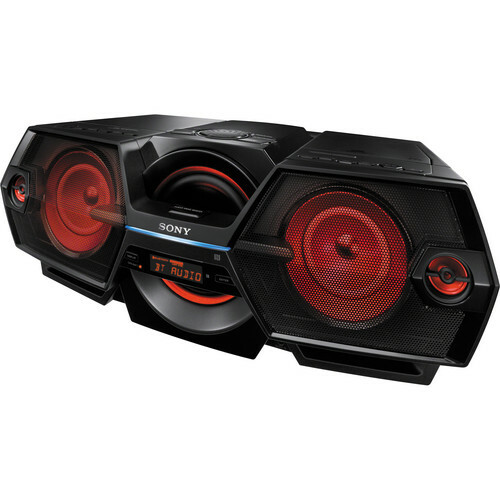 Rated 5 out of 5 by Dylann Lee from Makes Me Feel Like I'm in the Club I love this BOOMBOX! It is sleek, stylish, has great tech features...and it comes with a remote!!! The upside is that it has great sound quality; good bass, powerful speakers and 6 preset EQ's for popular music genres. The subwoofer and red lights that sync to the beat of the music are an added bonus because it makes me feel like I'm in the Club. The downside is that it is portable, but bulky and it doesn't have a handle to carry the unit. So I worry about being able to transport this unit safely into my home after having a couple of drinks. Rated 5 out of 5 by Popeye The Sailor Man from ZS-BTG900 Bluetooth Wireless Boombox by The ZS-BTG900 Bluetooth Wireless Boombox by Sony is simply outstanding. In like manner, the folks at B&H are number one in all respects. I recently discovered B&H and I am extremely pleased with the way they do business. It is quite evident their Packaging and Shipping Department is well managed with Quality Assurance a top priority in shipping your merchandise. I have finally found an electronic sales company that takes pride in every phase of pre sale, packaging, shipping and post sale. BZ B&H! Rated 4 out of 5 by The Guba from One of the few remaining Boom Boxes Some people are overwhelmed by bluetooth or hooking up wirelessly to any speakers... I work with someone like that. She also refuses to update to a mp3 player or ipod/iphone for her music. She still wants to play CD's. Which is fine. But after trying several solutions, I made piece with the fact we needed to go back to the Boombox format. There are not too many out there now... and this one is pretty darn good. It's loud enough, but I wish it went a bit louder for filling the space completely. It has some red lights that flash with the bass which can be distracting, but it's a good bass sound with a solid upper range still coming through. Good for cheerleader rehearsal and classroom setting. Decent outdoors. IF you want to use your iPod, you can still plug in via minijack. Rated 5 out of 5 by Jodd911 from Excellent! I got this Boombox for my husband as a Father's Day present. He absolutelly loved it. The sound is great and it can get pretty loud if you need. We use it outside and inside the house, and it works well either way! I'm really happy with it,and I'm not sure if there's anything negative to say about this product. I'd suggest it to anyone! Rated 5 out of 5 by Nick from love it! The sound is great, the little light show setting is awesome, overall a great product! Rated 5 out of 5 by WILHELM from Great product I bought this radio/CD player as a gift for my husband. Having an outdoor bar, I have had several radios in the past. Most of them seem to last for about 6 months to a year. This one it is perfect in size, sturdy,wonderful clarity and all the options I could ask for.. The price was excellent and so is the product. I would highly recommend this. Rated 5 out of 5 by LCS from Happy Excellent product. Fast service. Rated 5 out of 5 by Christy the kid! from Boom Boom Boombox! Love the looks and sound of this wonderful product! It has a lot of nice features! Like the easy use of the remote of all functions!! Nice tight bass and also smooth midsand highs!! It's a great machine! You can't go wrong with this terrific Sony! Coolness factor,a pure 10!!! I need a replacement AC cord for this model! Can I purchase one separately? Where can I get another remote control for this boombox? Please contact SONY directly at 1-800-222-SONY. The music from the CD player in this boombox will not transmit wirelessly. It cannot be sent or recorded via Bluetooth. You can fall asleep while listening to the radio or music from the connected device using the sleep timer. The unit turns off automatically after a preset duration.1. Play the music source you want.2. Press SLEEP repeatedly to select the sleep time duration. Each time you press the button, the indication changes as follows: *AUTO; 60MIN; 30MIN; OFF; 10MIN; 20MIN.For the CD function, the unit turns off automatically when playback finishes or after 90 minutes. When using the BLUETOOTH, radio or AUDIO IN function, the unit turns off after 90 minutes.The sleep time duration is displayed for a few seconds, then the display returns to the previous indication. When the setting becomes effective, the display will dim and the light sync function will turn off.When the preset time has passed, the unit turns off automatically. *Note:Music playback on a device connected to the AUDIO IN jack does not stop automatically. To stop playback on the connected device, operate the connected device. To cancel the sleep function Press SLEEP repeatedly to select OFF. This boombox can receive Bluetooth audio from other devices, but it will not transmit, or send audio. Recording from this boombox via Bluetooth is not possible. Can I plug my iPod docking station into this? You can use the bluetooth to play your iphone playlist. Is there a function to turn the lighting off while it plays? Yes U can,but u loose the power bass,U will get just the regular bass!